Faisal Mawri, MD, is a renowned board-certified pediatrician specializing in emergency medicine and childhood dermatology at his practice, Mawri’s Medical Clinics, in Flint, Michigan. Dr. Mawri is committed to helping his patients, offering short wait times, extended office hours, and compassionate care for a variety of acute and chronic health conditions, including pediatric emergencies. 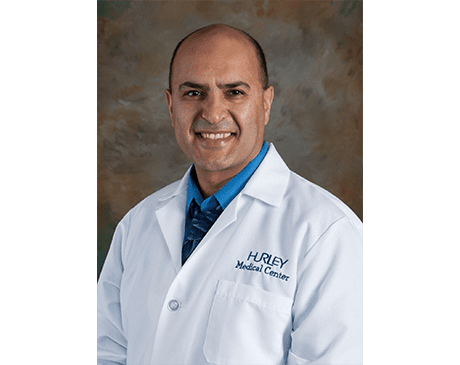 Prior to going into private practice, Dr. Mawri served as an attending physician and clinical instructor in the pediatric emergency department at Hurley Medical Center. He also worked as a clinical assistant professor in the Department of Pediatrics and Human Development at Michigan State University. He is certified by the American Academy of Pediatrics as a Community Access to Child Health (CATCH) facilitator. Dr. Mawri received his medical degree from the Universidad Iberoamericana in Mexico City. He then completed his internship at Tod Children’s Hospital in Youngstown, Ohio, and his residency at Hurley Medical Center. Dr. Mawri finished a scholar’s teaching program at the University of Michigan Medical School as well, where he also received his fellowship training. At Mawri’s Medical Clinics, Dr. Mawri provides a wide range of in-office diagnostics and treatment options for conditions like strep throat, influenza, rashes, and urinary tract infections (UTIs). He’s also skilled in platelet-rich plasma (PRP) therapies and the latest laser treatments for pediatric dermatology issues, such as acne and skin lacerations, using TempSure™ technology.